The center of Riverbend is The Lodge, a community center with expansive windows and verandas to enjoy the stunning views to the river. Daily activities encourage new friendships in a casual setting. It is an ideal gathering place for neighborhood get-togethers and can also be used for residents’ private functions or special events. 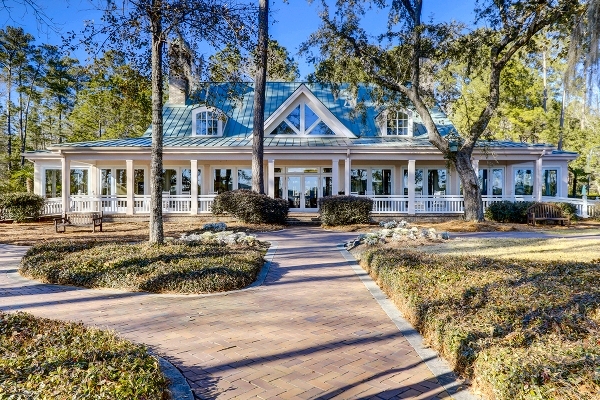 Southern charm and hospitality – this is the perfect place for discovering both. As Ralph Waldo Emerson wrote, “Lose yourself in nature and find peace.” High tide is spectacular, especially when there is a blue-nosed dolphin feeding in the river. Those in sync with the habitat will relish watching a bald eagle soar above, an osprey swooping towards the water to feed the young, or herons and egrets fishing for a meal in the marshes when the tide has gone out. This is just the beginning of the fauna and wildlife discoveries to come. Founded by Sun City, Riverbend is a separate, gated community with custom homes on larger lots for upscale living. However, residents here enjoy the benefit of low fees and have full access to the wonderful amenities and active lifestyle of Sun City Hilton Head as part of their ownership. Golf, tennis, theater, fitness, pickle ball, bocce ball, dog park, walking trails, clubs, and much, much more are only a golf cart ride away. There is truly something for everyone.